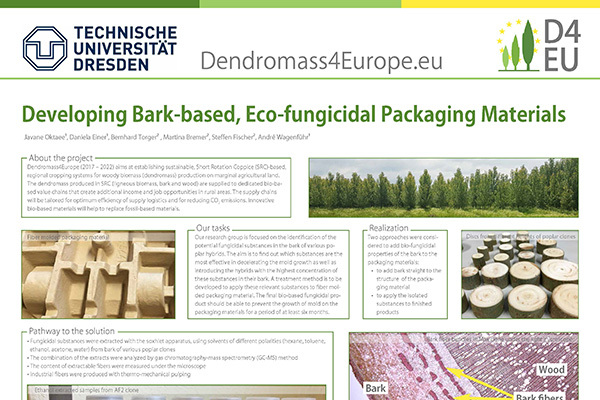 The tasks of the Professorship of Wood Technology and Fibre Materials Technology (HFT) and Institute of Plant and Wood Chemistry (IPWC) of TU Dresden are focused on identification of the potential fungicidal substances in the bark of various poplar hybrids. The primary goal is to find out which substances are the most effective in stopping the mold growth as well as introducing the hybrids with the highest concentration of these substances in their bark. In the second phase of the research, a treatment method is to be developed to apply these fungicidal substances to fiber molded packaging material. The final bio-based fungicidal product should be able to prevent the growth of mold on packaging material for at least six months. Two approaches were considered to add bio-fungicidal properties of the bark to the packaging materials; either to add bark, straight to the structure of the fiber-molded parts or to apply the isolated substances to finished products. To Add bark straight to the fiber molded structure of the packaging material, the amount of extractable fibers in the bark of different the hybrids, with same age and growth conditions, were measured and compared to introduce hybrids with the highest content of extractable fibers. Microscopic slices were produced from the bark of these trees (min. 10 trees) at breast height and the cross-section area, covered with fibers, was measured under the light microscope. The fibers were then extracted with two methods of thermo-mechanical pulping and double screw extruder and applied in the production of fiber molded materials. The tests showed that it is possible to replace up to 40% of the fibers in the packaging material with these fibers, and still reach acceptable consistency in the final products. 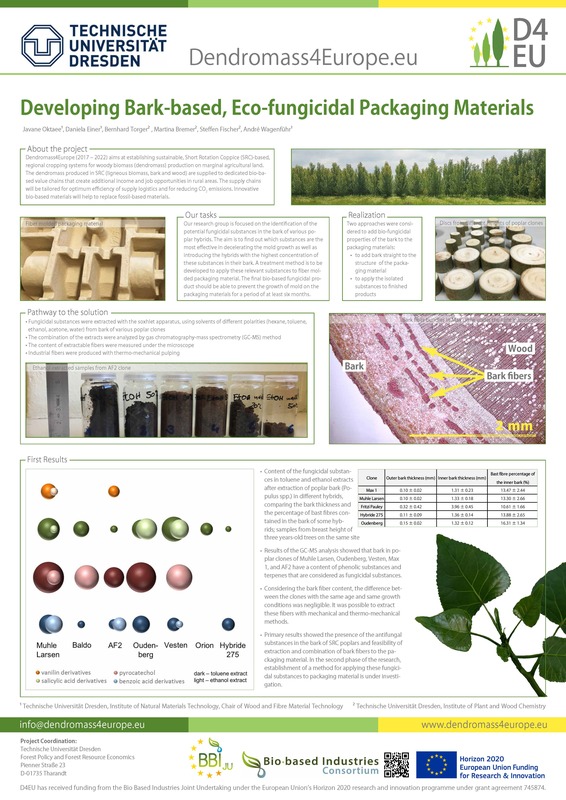 In the second method fungicidal substances in the bark of various poplar clones were identified, using the soxhlet extraction with solvents of different polarities (hexane, toluene, ethanol, acetone, water), followed by gas chromatography-mass spectrometry (GC-MS). Some of low molecular phenols or phenolic acids and some terpenes have been identified as potential fungicides in the investigated poplar barks. The results showed that bark of Muhle Larsen, Oudenberg, Vesten, Max 1 and AF2 clones hve a higher content of phenolic substances and terpenes that are considered as the bio-fungicidal substances. Primary results showed the presence of the antifungal substances in the bark of SRC poplars and feasibility of extraction and combination of bark fibers to the packaging material. In the second phase of the research establishment of a method for applying these fungicidal substances to packaging material is under investigation. This poster can be downloaded in the Download section. Next Post Next Post: Plantations are better than their reputation!